2012 – 2017 : MY FIRST 5 YEARS TERM ! my first five year term! Yep, five years already I’ve been the speaker voice (News and Talk) for RMC radio station. 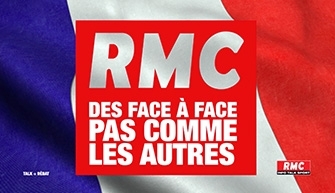 Becoming RMC’s voice over, at the start, was a lot of team effort : we had to work a long time on developing the station’s voice, its character, its rhythm - for France’s 5th most popular radio station. In the end it was a strong and poised voice that was selected for the job. Each week I am thrilled to work with this dynamic team who is always open to my suggestions for vocal proposals. So I’ve decided to run again for a second term as RMC’s voice over with this super resourceful team of people !